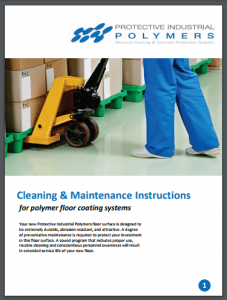 Why Should You Clean and MAINTAIN Your Industrial Floors? A polymer floor will look and perform its very best when cleaned properly throughout the year. You have a significant investment in your flooring and regular maintenance is important to keep all your floors in peak condition. Developing and implementing a comprehensive cleaning plan is critical for maintaining durable and attractive flooring. First, establish a cleaning plan and maintenance schedule. Using a floor map with specifications and frequencies can insure you are meeting the unique needs of each section of your floor. Then, make sure your employees are trained to use the correct tools, chemicals and procedures for effective cleaning. Regular maintenance is imperative to keep your floors free from debris, so abrasion is minimized while maximizing service life. The cost savings of regularly cleaning your floors is worth it, so you need to invest in the right equipment for employees to use in all areas. You want to use the proper equipment and chemicals that will maintain your floor without scratching. Oils and other spills can present a slip hazard. 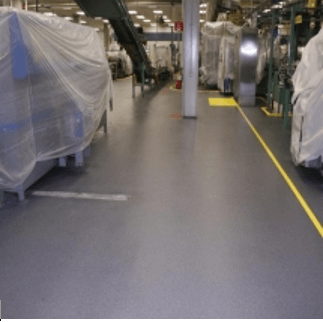 If you don’t keep your floors properly clean, throughout the day, you could end up having safety issues in your facility, too. And, keeping the textured service clean helps maintain the anti-slip properties of your floor. Routine cleaning will minimize these problems and help you to extend the gloss and integrity of your flooring. After all, the way your facility is presented to your workers and customers is portraying a message. What will your customers say about your facility? Make sure they say it’s clean and professional. To decide on what to use in your facility during the cleaning process, download these simple maintenance instructions.